Robert Dittman is an attorney, Coast Guard Auxiliarist, musician, and graduate of The Seeing Eye. In his limited free time, he constantly seeks adventure by sky diving, bungee jumping and water skiing. He’s the first blind person to complete a military boot camp program and serve on a Coast Guard ship. Robert’s personal motto is “Don’t let life get you down.” He believes that he can get through anything life throws at him when he has his Seeing Eye dog by his side. He was matched with his first Seeing Eye dog, a Labrador retriever/golden retriever cross named Harriet, in 1996; he was matched with Snickers, a chocolate Labrador retriever, in 2007. And in 2013, Robert was matched again—with Dr. Mary Kate Lawler, a veterinary surgeon! 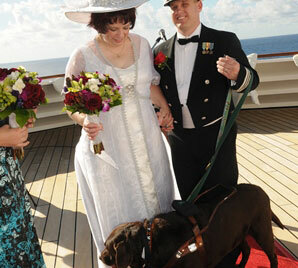 The two had been dating for 10 years, but made it official with a wedding aboard a Disney Cruise. Robert is now working with a black Lab named Jackson, his third Seeing Eye dog.